” Single people, whoever they are, feel their lonliness most acutely when they come home from a trip. Everything is there just the way it was when they set out. The flower in the vase has dried up, but the desk itself hasn’t moved.” -Santoka from his journals. Reflecting on this tour I think it is fair to say that it was the most successful to date. Sure it didn’t quite have the There and Back Again narrative of my 2009 tour to San Francisco but in pretty much every measurement it all went really well. It utilized the two weeks off that I had really well, it took me over a mix of new and familiar places, there were few problems, a good mix of sunny days to rainy and exquisite scenery. Returning from these trips there is always a bit of post-tour depression and while I can’t deny there has been some of that, its pretty mild. I’m still bicycling and wanting to do rides (which was not the case last year). The worst thing this year has been a sense of restlessness, that you’d have thought two weeks of travel would have alleviated somewhat, but the root cause of that is I think a bit beyond the scope of this blog. Anyway Looking back at the tour there are a number of issues that are worth reflecting upon. To begin with lets consider the route that I was worked out for this trip. My initial goal was to ride the Sunshine Coast, the region of British Columbia north of Vancouver. In riding to Vancouver I knew I’d want to stay there for a couple of days, so I knew I didn’t want to arrive there too early. I’d ridden there in two days a couple of years ago and even with a touring load three days is pretty reasonable. I wanted to arrive there on day five or six so I fiddled around with Google Maps (the cyclotourists best friend) and stumbled on the Mountain Loop Highway. In researching whether this has been ridden much I checked the Seattle International Randonneur’s permenant site and found several routes utilizing it. 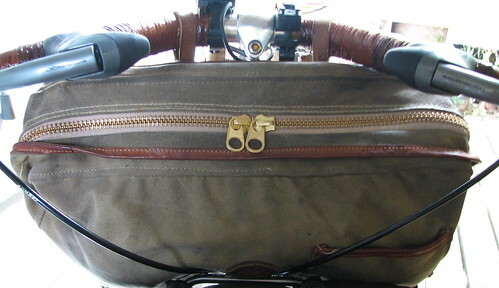 Randonneur’s ride all over a state and find many great routes so checking out routes they have ridden is essential. I would later utilize rando info form my cross Vancouver route as well. I was able to use Vicky Spring and Tom Kirkendall’s Bicycling The Pacific Coast books for routes and camping information from Birch Bay to Vancouver, The Sunshine Coast and the first day on Vancouver Island. The cross island route I found in a combination of Bikely routes (another vital resource) and the Vancouver Island Randonneurs. The Galloping Goose trail into Victoria and the Lochside out of Victoria I was familiar with and in the case of the Goose excited to fully ride for the first time. Finally returning home I used the route I worked out on my very first self supported tour, but with a modified route from Edmonds to Bothell that Google Maps new Bicycle route feature roughed out for me. I often modified routes either sourced from Google Maps with bicycle club, brevet or my own experience. My overall impression of this route was highly positive. The cross Vancouver and Mountain Loop routes, randonneur’s notwithstanding, are little bicycled routes and ones that people should definitely utilize. It was not without some sense of irony that the two rainiest days were the days I rode those beautiful, wooded unique sections. There was however some improvements I would make to the route. The most immediate was the two 70+ mile days on the east coast of Vancouver Island. These were pretty dull riding days mostly on highways and could seriously stand to be broken up. Fortunately there was actually lots to see and do on those sections and it is quite amendable to being broken up. This is how I would do this portion of the route again: Instead of Saltery Bay Park to Rathtrevor Beach Park, which was about~72 miles I’d ride to Denman or Hornby Island which would trim off about 35 miles. One could then ride one or both of those islands as one saw fit. The following day I’d ride to Nanaimo, about 50 miles, which was such a nice town that It’d be worth spending a bit more time there. There was numerous private campgrounds not too far from Nanaimo if one wished to camp instead of staying in or near the city. From Nanaimo to Lake Cowichan is about 50 miles of which only 20 or less would be on the highway the rest on much more pleasant Cowichan Lake road. Breaking the two days into three makes for three 50 mile days (more or less) which is pretty much how much I like to ride per day on tour. Plus the interesting northern Gulf Islands and towns would not have to be bypassed or blown through in service of grinding out miles. So if anyway ever wanted to use my route, that’d be the one change I’d make. This is my third extended tour with this basic setup and I have to say I pretty have this aspect nailed. There always is a couple of tweaks here and there but my core touring setup hasn’t changed for these three tours. The main change this year was on the bicycle which I’m happy to report performed the best yet. I had no flat tires, no serious mechanical, in short the bicycle was just how one would want it to: a part of the tour not the focus of the tour. I described in an earlier post all the changes I made to the bicycle so no need to rehash them. But it was of course my first tour with the Schwalbe Marathon Plus and I have to say I think I’ve found my tire. The 700x38s fit perfectly under my fenders and are pretty much my preferred size. No flats might be due at least in part to luck, but I have to say I rode on punishing roads, over much broken glass, dirt, gravel, horrible pavement, in heat, rain, everything but snow pretty much with no issues. I was checking air pressure regularly and the REI tubes I was using never lost much pressure even with pretty wide temperature changes from day to day. 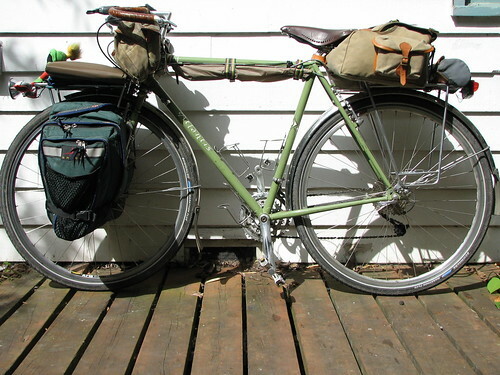 My new rear wheel from Rivendell was also rock solid, which was a relief: my last two tours were marred by worrying about the wheel. As for the rest of my gear, as I said the primary components remained unchanged. The key trio of tent (Eureka Spitfire), sleeping bag (Kelty Light Year CD 25) and cooking geat (Brasslight Turbo II alcohol stove and Snow Peak Trek 900 titanium cookset) continue to really serve me well, I can’t really recommend this gear strongly enough. I did bring a few other things this year which warrant a bit of a mention. Recalling a lack of potable water at some Provincial Parks in my Gulf Islands tour I brought a Nalgene collapsible bladder which proved its worth on numerous occasions. I bought a large Irish Strap from Rivendell (I’ve long used the small ones for strapping the tent poles to my frame) which proved itself well worth having, I’ll probably add another of these for future tours. I used this to last the full Nalgene waterbottle to my saddlebag, to tie down my bicycle on the numerous ferry rides, to secure groceries to the front rack and numerous other examples I’m forgetting. Beyond mixing the clothes up a bit that’s really about it for equipment changes (minus the power recharging change I discussed earlier). The ride beyond the previously discussed technical aspects of the route and the performance of the equipment, for me covers everything else. The timing of this tour was partially based on work (I had a project that run though July pretty much) and by a desire to tour after the kids had gone back to school. My initial plan was to start on Labor Day weekend, using that day off from work as a bonus day. Due to how the project actually ended at work and the fact that the next project would be (theoretically) starting up early in September I decided to change the dates slightly so as to end on Labor Day weekend. I also chose to end the tour on Sunday so that I would have a day of recovery (labor day) something I’ve learned from previous tours is essential. This turned out to be rather fortuitous as, especially north of Vancouver, I was right about at the limits of my temperature range. That is to say I was right on the edge of being too cold at night. It has been an unusually cool late summer so in other years this wouldn’t be the case. September is pretty much my favorite time to tour and this doesn’t change it. It was a lucky break for this year, but it does mean that the campsites were often pretty full. I ended up not having any issues with this though I worried about it to some degree. The weather also really turned fast this year, with the rainfall in September being well above average, so again lucky. The weather in the Pacific Northwest can be fantastic in September, but its always a bit of a gamble. I did have three days of rain, one all day as I rode to Port Renfrew the morning rain as I left Vancouver and the half day of rain on the Mountain Loop highway. Only on the ride to Port Renfrew did I get completely soaked, the other two days I got wet but had dried off by the time I got to camp. The weather on the rest of the days was nice; often cloudy, but with a good mix of sun. No overly hot days which can also be a trial, in the main I’d say this was about as good as it gets weather wise in the PNW. I tried to camp more this trip and to avoid hotels by staying in hostels. This was in part to save some money (I was doing this trip a bit on the cheap) but also to try to do things a bit differently. I’d done hostels on my first self-supported tour and found it a bit mixed. For this tour I got my own room at the two hostels I stayed at ( HI Vancouver Downtown and HI Victoria), which while obviously more expensive was about half of a hotel or B&B in those expensive cities. I did end up at a normal hotel in Port Renfrew (the West Coast Trail Motel) which while not specifically anticipated I do often end up in at least one hotel unexpectedly for whatever reason. This tour was a really good time, a nice break from work and a nice exploration of areas I’d mostly not been previously familiar with. Things went really smoothly, I had some nice interactions with nature and various people I met on the route. I saw a few other tourons now and again but none of the tour rats I encountered on the west coast nor the crowds. The more “off the beaten path” areas I visited were the highlights for me, but I enjoyed almost every place I rode through. I do have to say that I felt a bit detached on this tour, perhaps due to a general familiarity with the touring routine, or perhaps its just as part of the touring on a time frame experience. Even with flexibility you have to keep moving, you can only spend so much time anywhere. So it it starts to feel like you arrive at a destination of interest, you get off your bicycle, look around a bit and then just set off again. Rarely can your spend hours in an interesting area unless it corresponds with a short day or a rest day. This aspect I find rather limiting and frustrating; I would love to be able to do months long tours with only vague agendas. Anyway this aspect, which I’ve certainly noted before, tends to give me this sort of detached, “just passing through” sort of feeling. It is this and also as a nod to the Jack Kerouac novel (collected in Desolation Angels) that I dubbed this tour “Riding Through“. This was one of those days where any hassles one has gone through seem absolutely worth it. And yet it began auspiciously enough with the power going out in Port Renfrew. I was still able to take a hot morning shower and when I rode down to check out found the restaurant was open on generator power. So I was able to get coffee and Internet access and all was well. No rain either. The ride though us what really made the day, though again it started out rather direly with an especially long climb. The roads would continue to climb but also descend a lit as the route wound it’s way through coves and river valleys. It began in trees with glimpses of coast now and again and then a full on view of the ocean on a bridge crossing. It had been cloudy and chill, but slowly patches of blue became bigger until the sky was mostly clear. Around this time I burst out of the trees and was on a beach in bright sunlight where I actually saw people surfing. The climb up from that beach was rough and at the top I pulled over to take off my legwarmers and found wild chickens roosting in the bushes there. The day was warm and clear and I was mostly on the coast on these roads that wending along like a Swiss mountain road. Really lovely riding though certainly not too easy. But just ad I was wearing down I was at the turn off for camp. Sooke-Potholes Regional Campground turned out to be a land trust run by the Land Conservancy of Canada and is one of the best campgrounds I’ve seen. There is a Cyclist Camping area here that is donation supported with covered picnic tables, fire pit with benches, groomed pads for tents and easy access to water. And it’s right on the terminus of the Galloping Goose a 50km rail-trail that goes right into Victoria. Plus you can hear the babbling if the river here and there us do little light pollution that the stars are legion. Great place. There was no one here when I arrived but as I finished dinner a pair of tourons arrived from Portland. They built a fire and we ended up chatting about the usual (travel, bikes, single-malt etc) until we all got cold. It’s nice to have the camaraderie of fellow tourons now and again. It was another long day today with even more miles ridden, but I don’t feel nearly as beat down as I did yesterday. Perhaps it is acclimatization, perhaps I simply spaced it out better but I think it was the lack of wind. The day was spent mostly on highways which are mainly charmless and without too much to see. The best riding of the day was into Nanaimo on bicycle paths and signed routes ending at a very scenic waterfront. There was a waterfront path, tiny little foot ferries to an island, parks and cute little shops. Above the harbor was a quaint shopping district filled with coffee houses, bookstores, restaurants and the like. I spent an hour or two here and could have explored a lot more. Go back behind your cloud. Come out from behind your cloud. Note: posting could be sparse for the next couple of days. Today would my last day on the Sunshine Coast and the first on Vancouver Island. I would also hit the apex of my northern travels and begin the southward journey. I am now past the halfway point of the tour and from here on out have less days ahead of me than behind me. The day began rather leisurely in the morning but would become a hard slog in the afternoon. The last little bit on the Sunshine Coast was a nice ride on rolling hills then a scenic bit of coastline before finally ending in the town of Powell River. It had been a cold ride and the sedate pace was a welcome chance to warm up. However I had two hours before the ferry so I spent this in a coffee shop charging the phone, drinking coffee and other such activities. The ferry was the usual scenic affair though this was easily the most beat down BC Ferry I’ve been on to date. The route, as it was heading to an island, was more in open water, so the mountains of the coast and Vancouver Island were more distant. When I left the ferry it was now early afternoon and I had 55 miles to ride. This was rather unfortunate in that there was interesting looking sidetrips and things to explore but due to my upcoming route across the island I had to bear down and do this long afternoon ride. To add insult to injury there was a vicious headwind the entire way, which just further wore me down. So not much to report, though there was an awful lot of beautiful scenery and quaint little towns – an area worth coming back to. Walking on the beach in the gloaming I realized it had been quite a few days since I was last on the ocean. The gentle surf I find calming but there is always a tinge of sadness. Tour 2010 begins now! This year I’m heading to the Great White North, on a route of my own devising and will be exploring the Cascade Foothills in Washington State then onto British Columbia in Canada where I’ll ride the Sunshine Coast and Vancouver Island. I’ve worked out routes that put me on new roads and will let me most see new places than I have on my other trips up north. Most everything else I’m using this year remains the same, so if equipment lists are of interest, check out my tour 2009 packing list. There are of course a few changes here and there, but they aren’t really that big of deal. As I mentioned in my Atlantis repair post a couple of days ago, I’ve been waiting for my Hobo Bag to get its zipper replaced and I’m happy to report that I picked it up yesterday and it is better then new: they put in a metal zipper as opposed to the original plastic. I’m pretty happy about that as I inquired if they could replace it with a metal one and they said they didn’t have one. But when I picked it up they said they had a few and that this bag cried out for one. I fully agree. So a big thumbs up for Rainy Pass, I wholeheartedly endorse them. Anyway enough preamble, I’m on the road in just a couple of minutes. Keep an eye on this blog for further updates as I can and power willing. I’m going to try to do a daily post but it may be a bit less journal like than last year. I’d like to post a more coherent narrative when I get back, so I’m planning to do quick updates here and keep a more thorough journal from which I can write that.